Despite what some may say, I believe that there is a valid argument for supplementing our diet to some degree even if we eat healthily. There is evidence to suggest that our food doesn’t have the same level of nutrients in it that it once did. Our parents and grandparents generation were blessed with having foods which were grown more organically and weren’t over farmed. Fields were left unplanted to give them a chance to renew themselves, crops were rotated more frequently. This gave the land, the earth, a chance to replace valuable and much needed nutrients in the soil that would then help the new crops to grow and thrive. And the animals then fed from those nutrient rich plants which in turn made them healthy too. We now over farm, over use pesticides and fertilisers, deplete the soil and then the food we do eat ends up being over processed. Add to this a good dose of everyday stress and our nutrient quota can be hit quite considerably. Therefore, for me anyway, having a few supplements in my nutrition armoury is important and essential. Apart from utilising a select few supplements ourselves, I truly believe we should seek out a properly informed nutrition expert / therapist to help us if we feel that our body is in need of a helping hand nutritionally. It worries me when I see some people popping supplements as if they are going out of fashion. We are all unique and it’s important to understand what your body really needs rather than wasting a whole lot of cash on supplements which may not work or may even harm. Our body will respond to what we give it and if you are not properly informed and supported, you may in some cases cause a healing crisis to occur. Having said that, there are some supplements we can safely utilise which our bodies need and will enhance our overall health. One of those is omega 3. Our bodies cannot make this and omega 3 contains 2 essential fatty acids EPA and DHA which our bodies need to stay healthy. We normally get it from our diet and it is essential to good health. However, modern man is severely depleted in this vital nutrient. We should have a ratio of 1:1 of Omega 6 to Omega 3 in our diet, however some people have a diet which is 10:1 with some as high as 30:1 in favour of Omega 6 ! It’s fair to say that we probably all have need for a good quality Omega 3 supplement to redress this balance. Omega 3 is rich in essential fatty acids EPA and DHA and can naturally be found in certain oily fish for example anchovies, herring, mackerel, salmon (wild has more omega-3s than farmed), sardines etc. However, most of us do not eat a diet rich enough in these foods and with the worry of heavy metals being found in certain fish, we are advised to only eat a few portions per week anyway. So what can we do? We can supplement. And this is where a supplement such as Bare Biology’s Lion Heart Omega 3 Fish Oil comes in. Founder Melanie Lawson has worked tirelessly to bring the consumer a pure, clinical strength omega 3 oil you can trust. And one which will also help you redress the balance of your omega 3 quotient. Just one 5ml spoonful (1 teaspoon) gives you a total omega 3 dose of 3,515mg. In addition this one teaspoon also gives you 1,995mg of EPA and 1,140mg of DHA (The recommended dose for normal blood pressure is 3,000mg of EPA & DHA per day). To get the same level of these essential fatty acids into your body from another leading brand you would have to take up to 28 capsules ! Bare Biology have been given a 5 star rating from the International Fish Oil Standards (IFOS) and their oil is free from contaminants often found in many fish oils. They only use smaller fish such as wild sardine, anchovy and mackerel that live in clean waters in the deep southern Pacific Ocean. They’re naturally high in Omega 3 and lower in environmental toxins because they’re small and don’t eat other large contaminated fish. They also have a short life span so less time to build up pollutants in their bodies. Bare Biology’s website is full of really useful information and well worth taking a look at. 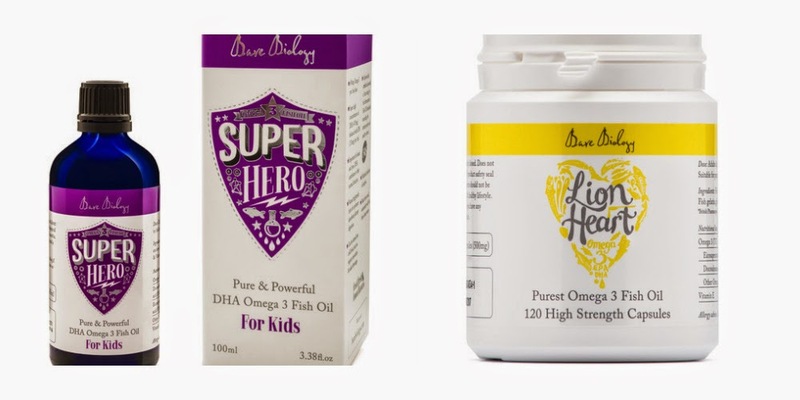 They have also recently launched their children’s omega fish oil ‘Super Hero’ and for those who do not like to take an oil or prefer capsules, they have just launched a capsule variety too. Melanie kindly sent me one of the Lion Heart Oils to try out and it is really pleasant to take. It has lemon oil in it which makes it very palatable. And because of its purity you do not get any fishy taste or repeating of the supplement going on either. Sophia and Jess willingly took it and I noticed a marked improvement in how much calmer they were, more alert, and that any dry skin improved over a month of taking it. These oils aren’t cheap, but I’m a great believer that you get what you pay for. And if you actually compare how many capsules you would need to consume to get the same level of omega 3, EPA and DHA, I think you’ll agree that this is in fact value for money and value for your health too. Have any of you tried Bare Biology Omega 3 Oils? Do let me know your experience of them if you have. 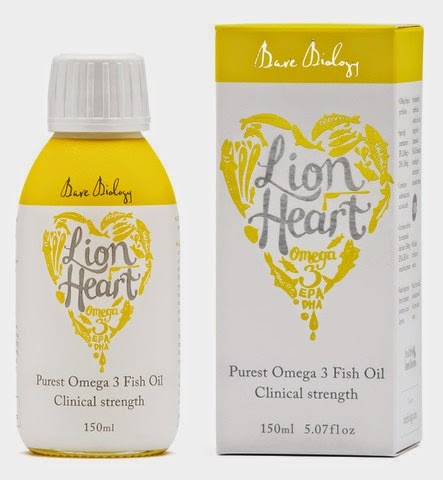 Disclaimer: I was kindly given a bottle of Bare Biology Lion Heart Omega 3 Oil to try out. All thoughts, feelings and opinions are my own and no one else’s.